From the trade mags in your mailbox to the email newsletters in your inbox, everyone's talking about the Industrial Internet of Things (IIoT), also known as Industry 4.0. But a recent study by Emory University* suggests that talk hasn’t translated into real-world implementation in the maintenance profession. It’s likely the IIoT is on your long “To Do” list—or at least on your radar. So, let’s talk about the obstacles that other maintenance professionals have experienced, and why. The IIoT describes systems that gather information directly from multiple devices, which can be almost anything with a sensor—including computers, vehicles, smartphones, appliances, building automation systems, and production equipment. For the maintenance team, that means more real-time data to provide better insights into your assets, how they’re working, and what they’re really costing you. Lack of skill sets. 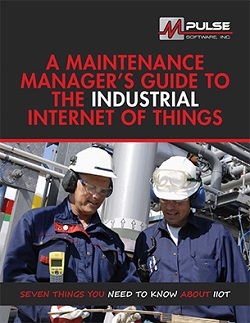 The IIoT requires a different skill set than most maintenance professionals have, as it merges operating technology with information technology. That means there’s both a lack of understanding about the IIoT and its capabilities, as well as simply a shortage of qualified employees with data management skills to get started. Current system still works. Many modern maintenance operations have fully embraced the preventive maintenance approach, which is working for them. So, some maintenance professionals don’t see the need for changes to their current workflows. Cybersecurity. IIoT data has value, which means it comes with challenges related to its safety and security. With active threats to IT systems growing constantly, maintenance managers are hesitant to bring new systems online without addressing concerns about complexity, data security, privacy, cyber attacks, hackers, disruptions, malware, sabotage, and data theft. Data silos. Traditionally organizations have used business software that creates little islands of computing power spread out across the organization. The proprietary nature of most systems and technology can make it hard to integrate technology vendors, IIoT systems, and external data sources. All these factors are valid, and they can be addressed by talking to people with experience in implementing IIoT technology. Start by calling our industrial technology experts at (800) 944-1796 (USA and Canada) or +1 (541) 302-6677 (outside of USA and Canada). We’ll help you navigate your obstacles and make a plan that works for your organization. Next time, we’ll talk about why moving past these obstacles is critical to modern maintenance operations. * Jalan, Arnav. “The Future of IIoT Predictive Maintenance,” Emory University and Presenso, https://www.presenso.com/blog/emory-research, May 28, 2018.